A tribute to the soul who have left thousands of raga to those who loves dadra and Hindi ghazal. I been amazed and became fan of this late Indian classical singer and just posted a song that she may have sang some 40 years ago. 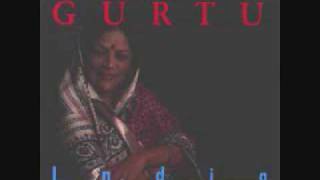 Shobha Gurtu (Hindi: शोभा गुर्टू) (1925 – 2004) was an Indian singer in the light Hindustani classical style. Though she had equal command over pure classical style, it was with light classical music that she received her fame, and in time came to be known as the Thumri Queen, and for the ‘Abhinaya’ and in her full-throat-ed voice. This ghazal in form of “Dadra” is one of the most popular and heart touching. I love this sound and hope all of you love it as well. Enjoy the moments. Bhanumati Shirodkar was born in Belgaum, (present Karnataka) in 1925, she was first trained by her mother Menekabai Shirodkar, a professional dancer, and a ‘gayaki’ disciple of Ustad Alladiya Khan of the Jaipur-Atrauli gharana. Though her formal music training began with ‘Ustad Bhurji Khan’, the youngest son of Ustad Alladiya Khan, the founder of the Jaipur-Atrauli gharana in Kolhapur, from whom her mother was learning at the time, while she was still a younger girl, and seeing her talent, Ustad Bhurji Khan’s family immediately took a liking of her, and she started spending long hours with them. Her ties with the Jaipur-Atrauli gharana were to strengthen still, when she started learning from, Ustad Alladiya Khan’s nephew Ustad Natthan Khan; though she really came into her own under the tutelage of Ustad Ghamman Khan, who came stay with their family in Mumbai, to teach her mother thumri-dadra and other semi-classical forms. Shobha Gurtu specialized in semi classical forms as thumri, dadra, Kajri, Hori etc., effortlessly adding pure classical passages into her singing, thus creating a new form, and reviving the magic of forms like, Thumri, of which she became a greatest exponent in time. She was particularly influenced by singer Begum Akhtar and Ustad Bade Ghulam Ali Khan. She also performed music in Marathi and Hindi cinema. As a playback singer, she first worked in Kamaal Amrohi’s film, Pakeezah (1972), followed by Phagun (1973), where she sang, ‘Bedardi ban gaye koi jaao manaao more saiyyaan’. She earned a Filmfare nomination as Best Female Playback Singer for the song “Saiyyan Rooth Gaye” from the hit film Main Tulsi Tere Aangan Ki (1978). In Marathi cinema she sang for films like Saamna and Lal Mati. Over the years, she travelled all over the world for concerts, including at one the Carnegie Hall, New York City, performing alongside musical greats and, Pt. Birju Maharaj. Her album of gazal “Tarz” along with Mehdi Hassan was popular. She often lend her voice the collaborative jazz albums, of her son Trilok Gurtu. In 2000, she featured in the Jana Gana Mana Video, which was released to mark the 50th year of the Indian Republic, where she sang the Indian National Anthem, Jana Gana Mana, along with other leading classical singers and musicians of India. She married Vishwanath Gurtu, and took the name Shobha Gurtu. Her father in law, ‘Pandit Narayan Nath Gurtu’, was a highly placed officer in Belgaum Police, scholar and a sitar player. Her son Trilok Gurtu is a famed percussionist. Her other son is Narendra. Sources: Article Credit from Wikipedia, Picture Credit: Amazon. Editor’s Note: We are not holding any rights of this music and pictures, shared for public listening only. We are not aiming to violate any copyright and other rights on behalf of Nepalone Networks. If any of you have concerns about the rights please contact us with the proof of the rights and we will take further actions to remove this Post. Thank you. -Admin.